PayPal (US Only) Can also be used for payments by credit card. For Those with immediate or special needs to understand how MLM works or about a particular MLM they are in or are being solicited to join. PDF File will be emailed to you within one day.  Painstakingly researched and powerfully written by Robert FitzPatrick, PSA President, Expert Witness in MLM court cases, and author of the book, False Profits.  Special Section on the Amway payouts and the secret "tools" business.  How the Myth of MLM Income Opportunity is maintained. PDF File will be emailed to you within one day. Phone Consultation will be arranged immeidately afterwards. 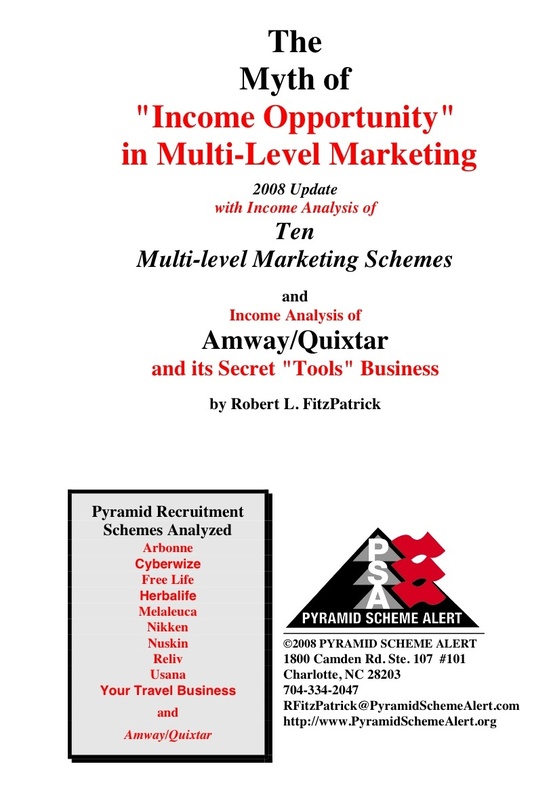 This Report may also be ordered with a personalized 30-minute telephone consultation with PSA President and MLM Expert Robert FitzPatrick. Note: This is not legal advice, but professional business consultation for better understanding and evaluating MLM claims, promises, operations and solicitation. The phone consultation will be arranged at a mutually convenient time. Follow up emails are included. This is for those who have special or immediate needs.